It's half inside and how in the sunshine. Use that topspin in a jungle showdown. You're so close to the ocean that your balcony feels like it could be on a boat. Comfy couches and custom-picked decor make for a homey environment. This resort towers over the sparkling sands of an amazing beach. Even on a rainy day kids will find fun at the resort's movie theater. Awarded a TripAdvisor Certificate of Excellence and set beside the white sands of the Gulf in Panama City Beach, Celadon Beach Resort by Wyndham Vacation Rentals is a great choice for your next family vacation. Once you get settled into your condo, get changed into swimsuits, grab goggles and inflatable swans and slather everyone head to toe in sunscreen. There’s a heated indoor/outdoor pool with a relaxing sundeck, perfect for working on your sun-kissed look as well as a Gulfside pool. If the weather is cooperating, take advantage of the charcoal grills for a laid-back family cookout. Recruit your little helpers to carry burgers, hot dogs and side-dishes. Then lay out the condiments and toppings and let everyone go to town. If you’re into tennis, head across the street for a game or rally on the resort’s lighted court. You can also stay in shape at the well-equipped fitness center. On rainy days, you and the kids will appreciate the on-site movie theater. For an epic day on the Gulf waters, there are jet ski rentals right on the beach and parasailing rides close by. Individually decorated one- to three-bedroom condos sleep six to eight guests. Your full kitchen allows you to get in touch with your inner Betty Crocker. Whip up a batch of your famous brownies and remember, there’s no such thing as too much chocolate (take comfort in the fact that you’ll have an in-suite washer/dryer in case things crazy). Enjoy the brownies while you watch a sitcom rerun or movie on the Cable TV with DVD player. Bring favorite movies from home or browse the selection of free DVD rentals provided by the resort. Before turning in for the night, watch the sunset on your private gulf front balcony. Attention, shoppers! 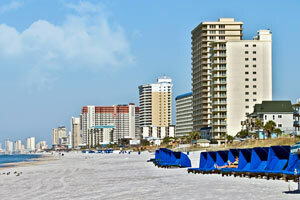 Pier Park Mall is less than three miles from Celadon Beach Resort by Wyndham Vacation Rentals. For apparel, there’s American Eagle. Bargain hunters will love Target and Marshalls. For those who like department stores, you have your choice of Dillards and JCPenney. Little ones will love Toy Kingdom. Starbucks is perfect for a mid-afternoon caffeine fix. Grab lunch at Red Robin Burgers, Olive Garden or Jimmy Buffet’s Margaritaville. Don’t forget to stop by Marble Slab Creamery or Dippin’ Dots for dessert. Enjoy a day of fun at Coconut Creek Family Fun Park. Test your navigational skills at the Gran Maze. It’s about the size of a football field and the course changes frequently. There are also two 18-hole mini golf courses perfect for golfers of all skill levels. Ripley’s Believe It or Not will be a big hit with adults and kids alike. The Odditorium features an authentic shrunken head as well as a 19th-century vampire killing kit. Experience the Moving Theater 7D. It has moving seats and digital effects (not for those who are prone to motion sickness). Or navigate through a maze of lasers in the Laserace timed challenge. - Front desk is open 4:00 PM to 5:00 PM daily. Guests who arrive after check-in hours can use the phone outside the front door of the office to get the code to the lock box. Guests must then return to the office the next day by noon to complete check-in.